This opens up new questions about how Neanderthals and Modern Humans interacted with each other. Neanderthals may have had more influence on modern humans than previously thought, including trade, teaching of skills, cultural exchange, and interbreeding. In the extended family tree of the modern human species, our closest relatives are the Neanderthals, officially called Homo neanderthalensis. Although it is not common to refer Neanderthals as “humans,” they can accurately be called that since they are in the genus Homo, along with several other species of primitive humans. Neanderthals are not the ancestor species of modern humans, Homo sapiens. Rather, Neanderthals are our cousins. We share a common ancestor, an even older species of humans called Homo heidelbergensis. Our lineage split with the Neanderthals more than 350,000 years ago, evolving separately thereafter. Neanderthal fossils have been found in Europe and the western parts of Asia. We know from fossils of early Homo sapiens that our ancestors lived in Africa during nearly all of the time that the Neanderthals roamed the lands of Eurasia. That geographic isolation is what allowed the two species to diverge. Previous dating of the fossils of Neanderthals had shown that these thick and hardy humans died out rather suddenly around 40,000 years ago. Despite finding thousands and thousands of bones and other fossils, nothing younger than 40,000 years old had ever been found that could be traced to the Neanderthals. Forty-thousand years is also the age of the oldest known European Homo sapiens fossils and artifacts. In other words, the disappearance of Neanderthals seemed to coincide almost exactly with the appearance of modern humans in Europe. The conclusion drawn by most scientists was that the Neanderthals were eliminated rather quickly by the encroachment of modern humans. This elimination might have taken the form of direct attack and genocide: the human species certainly has a dark and violent history when a more technologically advanced people encounter a less advanced one. However, competition for limited resources was probably more to blame for the extinction of Neanderthals. Modern humans and Neanderthals lived in similar ways, hunted the same animals, and ate the same plants. The competitive exclusion principle states that two species that live in the same way and consume the same resources cannot co-exist for very long. Even a slight advantage for one species quickly results in the elimination of the other. 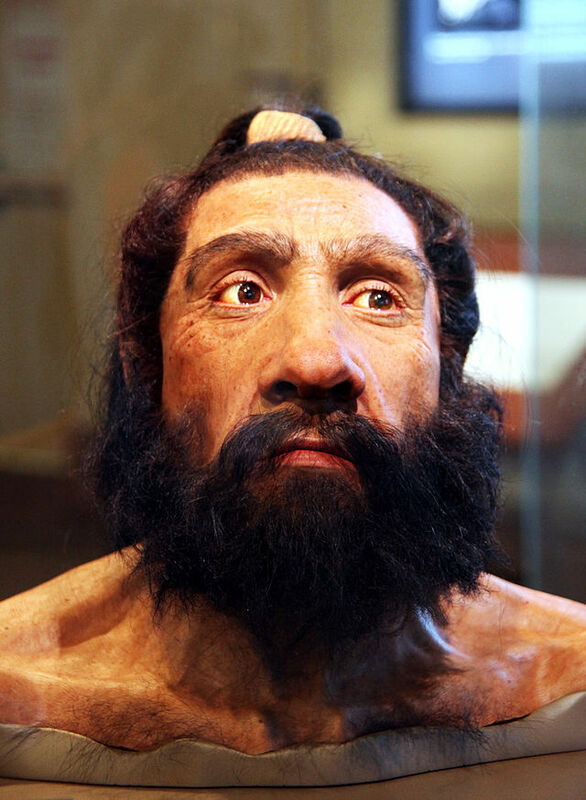 Neanderthals simply could not compete with modern humans. In a new study, more accurate dating reveals that the disappearance of Neanderthals from Europe did not occur quite as quickly after the appearance of modern humans as we had previously thought. Instead, the two species of humans lived in the same geographical areas for several thousand years. This forces us to re-think the interactions between humans and Neanderthals during the period of overlap. How was this study performed? This study was a re-examination of bones and artifacts from forty different Neanderthal sites across Europe. Carbon-14 dating is impossible for objects older than 50,000 years of age because all of the detectable carbon-14 will have decayed by this time. However, objects older than 30,000 years old also pose a challenge to archaeologists. This is because the amount of carbon-14 is so small that contamination with even the tiniest amounts of soil or other materials can obscure the analysis. Scientists from the University of Oxford employed a new version of the carbon-14 dating method involving mass spectrometry. Mass spectrometry analyzes material atom-by-atom and is thus extremely sensitive. This tremendously reduces the problem of contamination and allows much more accurate dating of materials, even in tiny quantities. By re-testing thousands of Neanderthal remains and artifacts from across Europe, the scientists were able to provide a more accurate timeline of how long the Neanderthals persisted in Europe. In 2011, scientists at the University of Vienna also used enhanced dating techniques to establish the age of the earliest known modern human remains and artifacts throughout Europe. Therefore, it is now possible to more accurately compare the timeline of the appearance of Homo sapiens and the timeline of the disappearance of Homo neanderthalensis at dozens of specific geographic locations. This comparison reveals that Neanderthals and modern humans co-existed in close proximity for thousands of years. Although the estimates vary from 2500 to 4600 years, and different locations show different lengths of overlap, we now have a high degree of certainty that Neanderthals and modern humans lived as neighbors for one hundred or more generations before the last Neanderthals died. For reference, the time of overlap was at least as long as the amount of time that has passed since the foundation of the city of Rome. That’s a long time for these two species to have lived together. The question of “What does it mean?” is always the most controversial in the field of archaeology. In this case, the only thing we can say for sure is that Homo neanderthalensis did not succumb to competitive exclusion by Homo sapiens nearly as quickly as we had thought. This means that, either the competitive advantage that humans had over the Neanderthals was very slight indeed, or the two populations found ways to partition resources and live together in relative harmony or indifference. Given all of the time that the two species co-existed in the same places, several ideas that previously seemed highly unlikely suddenly become plausible. For example, it was not previously thought that communities of Neanderthals and communities of humans engaged in trade or exchanges of goods. However, now that we know that they lived near each other for thousands of years, it becomes almost inconceivable that there wouldn’t have been at least occasional exchange of goods, if only by theft. With exchange of goods comes exchange of technology. Neanderthals were tool-makers, too. Although their tools were more rudimentary than that of the modern humans, it seems likely that those tools would have been better suited to the unique conditions of their longtime European homeland than those of the modern humans, who would have only recently migrated from Asia Minor. Tools are not the only things that might have changed hands. Jewelry and other adornments have been found at Neanderthal sites that date to long before modern humans arrived. It also seems likely that Neanderthals buried their dead and practiced funeral rituals. The suspected Neanderthal funeral sites are substantially older than the oldest known Homo sapiens funeral artifacts. It has even been supposed that some Neanderthals built boats and were sailing the Greek Islands 50,000 years before the first signs that modern humans did. The point here is that Neanderthals had nearly all of the technology and cultural implements that we have associated with modern humans of the same time period. The emerging picture of the interaction between Neanderthals and modern humans is one of near-equals. With this new study, it now seems likely that tribes or bands of these two species came into contact with each other regularly throughout Europe for thousands of years. This means that technology, cultural practices, and even ideas may have flowed freely between them. Like anywhere else, the early humans of Europe left their own distinct signature of artifacts, from tools and trinkets to hunting styles and strategies for shelter. We may never know which of these seemingly unique human customs may have actually been taught to us by our Neanderthal cousins. While there is currently no way to measure Neanderthal intelligence, keep in mind that their brains were considerably bigger than ours are. The most famous of all early human creations found in Europe are the cave paintings found in southern France and Spain. However, cave paintings by Neanderthals have also been found in that same region and they pre-date any known human paintings by thousands of years. Could it be that humans learned the technique of painting from Neanderthals? The question that most preoccupies scientists about the interactions between humans and Neanderthals is, “Did they interbreed?” Although different lines of evidence have given conflicting results over the past two decades, the most recent and comprehensive studies argue that the two species did interbreed. 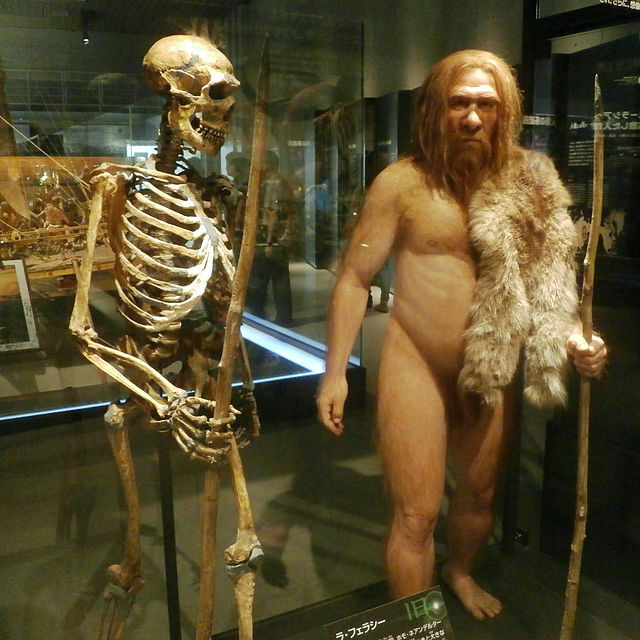 In 2010, the first draft of a complete Neanderthal genome was released. Using this, scientists have estimated that non-African humans carry at least 2% and as much as 5% of DNA that had its origins in the Neanderthal species. Interestingly, Africans carry no DNA that can be definitively traced to Neanderthals. This underscores the point that the interbreeding took place in Eurasia, where the Neanderthals had been living for eons, when the modern humans began to infiltrate around 40,000-50,000 years ago. Even more interesting is that, while any one particular person has only a trace of Neanderthal genes, collectively, up to 20% of the Neanderthal genome may be represented among the non-African humans alive today. Northern Europeans tend to have different parts of the Neanderthal genomes than southern Europeans do. The Han Chinese carry still different Neanderthal DNA, and so on. What this suggests is that the interbreeding of Neanderthals and humans was not a rare isolated event, but probably widespread in terms of time and place. This new study makes it clear that there was plenty of time and opportunity for this interbreeding to take place. That said, it is important to bear in mind that the vast majority of the DNA of European, Asian, and Native American peoples was passed down from the Homo sapiens ancestors, not the Neanderthal ones. This brings us back to the reality that, though it may have taken longer than we thought, modern humans did indeed overrun and outcompete the Neanderthals. We may have learned from them; we may have lived with them; and we may have bred with them. In the end, however, we absorbed a few and killed the rest, if not by direct force, by competition. Nevertheless, this study builds on many others that indicate that it is well past time that we discard our inaccurate image of Neanderthals as dim-witted brutes. As it turns out, they were not so different from us. To read the original study, please click here. Did a Drop in Testosterone Civilize Modern Humans? L’Uomo Erectus, nato in Africa un milione di anni fa, fu il vero padre ancestrale dell’Uomo Sapiens. L’Uomo Erectus possedeva una costola mobile, cioè delle reni, in più del Sapiens. Egli usò il fuoco. Anche l’uro, “bos primigenius” dipinto anche a Lascaux, possedeva una costola in più del toro, un dio non ancora antropomorfizzato a livello psichico. Il Sapiens, ossia Uomo di Cro-magnon, un portento nella caccia, però, visse per un po’ a contatto con quello di Neanderthal, un antropofago per lo più europeo, dal carattere sessuale più libero, dicono i paleontologi, e che tingeva di ocra rossa i morti e decorava le salme con fiori in caverne dei Monti Zagros, tra Iraq ed Elam. Io suppongo che Lilith, come demone biblico, in vero fosse un Neanderthalensis e che mal si accoppiava col Sapiens. Quando, poi, in rito sciamanico, e dopo una sonnolenta glaciazione, nella primitiva tribù umana si volle paragonare a forza vitale una rara bellezza di Sapiens Sapiens, cioè Eva, prodotto di una mutazione, si disse che essa nacque da costola di un Uro/Adamo. Ciò parrebbe molto strano, ma io inviterei ad osservare anche le corna di bovide che sormontano l’uomo raffigurato seduto di fronte a una donna nel cosiddetto Sigillo della Tentazione, ritrovato in Iraq, dove compare sia un albero dai bei frutti che il serpente: fin dagli inizi della storia vi è una simbiosi tra l’uomo, maschio o femmina che sia, e un simbolo di potenza animale. Eva, come nome ebraico, è l’onomatopea del vagito, per questo è detta la Vita. Una domanda: se nella Sacra Bibbia di Eva ce n’era una sola, come mai quell’omicida patentato di nome Caino vi trovò moglie, nell’iranico Paese di Nod? Il nome Caino indica un fabbro e i primi siti dov’era praticata la metallurgia nella storia sono attestati in Iran, proprio dove egli fuggì. ne, vi fortificarono città-stato. El Obeid è una località presso l’antica Eridu; allora, sorgeva presso il mare, il Nar Marattu, ovvero Il Mare Orientale degli Accàdi. Anche in Oriente vi è un fiume che ci ricorda la lingua mesopotamica di Sargon di Akkad: l’indiano Narmada. Da non soltanto vasi del Belucistan, raffiguranti estinti bovidi, ma anche da tavolette in cuneiforme di antiche città della Babilonia noi sappiamo degli scambi marittimi con quel subcontinente asiatico. Esistevano, infatti, delle bulle in terracotta che contenevano allora gettoni e sigilli di vario genere per gli scambi commerciali e su questi spicca una specie di zebù. Ancora i segni dei sigilli della valle dell’Indo non sono stati decifrati, benché a mio avviso la parola dio sia una ruota e non dissimile dal raggiante “dinghir” sumerico-babilonese. Una domanda: se le statuette ofidie di El Obeid si ricollegano idealmente alla cosiddetta Tentazione del frutto proibito, da chi furono scacciati quegli adamiti, dagli angeli con spade infocate o dai Gutei calati dai Monti Zagros? Forse dai topi, come accadde, poi, a suo tempo a esercito assiro? In questo caso, però, benché la Sacra Bibbia dica che l’assiro si ritirò dal campo di battaglia a causa di un angelo di Yahweh, non così è scritto in certi documenti in cuneiforme! Il non lontano giardino di Gu.edinna, sito tra le città di Umma e Lagash, un tempo era paradisiaco, non stepposo, e fu persino proiettato in cielo come costellazione rintracciabile in Pegaso. gran influenza sulle province costiere: e solo dopo Ramesse III, che nel delta del Nilo sconfisse i cosiddetti Popoli del Mare (tra le cui ondate sanguinarie in definitiva avvenne l’Esodo), solo allora si potè dichiarare che la regina Nefert-ari, una famosa moglie di Ra-messes, si fu infatuata di un certo Mosè, senza incappare nella vendetta implacabile dei faraoni contro la calunnia (ma forse di Mosè ne esistettero più di uno e, come scrisse il giornalista americano Lehrner, uno era solo egiziano: egli attraversò paludi del Mar Rosso e fabbricò serpenti in rame nell’oasi sinaitica di Qetta con fonderie, appunto, egiziane). Giocati! Una certa bestia ha diecimila occhi e orecchi dappertutto e riferisce tutto al visir. E fobie regnan sovrane sotto tale regime.